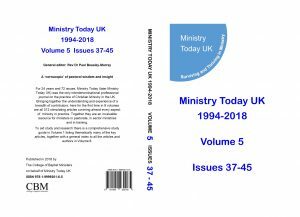 For 24 years and 72 issues, Ministry Today (later Ministry Today UK) was the only interdenominational professional journal on the practice of Christian Ministry in the UK. It remains an invaluable resource for ministers in pastorate, in sector ministries and in training. In 2018 Ministry Today UK closed leaving a legacy of wisdom and experience in 512 stimulating articles from a breadth of contributors covering almost every aspect of ministry in practice. At the request of the Board of Ministry Today UK, The College of Baptist Ministers republished all those articles in eight volumes. Hard copies are now available from copyright libraries and in many theological libraries. But now in response to requests we are also making the volumes available as PDF files. To help you find your way around this cornucopia of resources there is a study guide listing many of the key articles according to 57 themes, arranged alphabetically. This is followed by a general index to all the articles and authors. You can download the Study Guide and Comprehensive Index completely free here. From the limited print run all the paper copies of the Legacy Volumes have now been sold and reprinting will be uneconomical. In response to requests we are happy to make the PDF files of those volumes available. All 512 articles in 8 volumes making over 2900 pages of distilled insight, wisdom and experience, in completely searchable PDF files: the price for this invaluable resource is only £10.00 for the set of 8 volumes. That is less than 2p for each article! We will send the PDF files to your email address straight away. The files will be yours to read, search and quote or cut and paste as you like. We trust ministers to respect copyright and not to pass the files on to other people but rather encourage their friends to purchase their own copies. We know that many ministers will be happy to have their own copies of the articles to be able to access on all their devices at any time and anywhere. However CBM are continuing to keep the Ministry Today UK website live so all the articles will remain online together with 24 years of book reviews.